Most people seem to have switched to statically generated blogs like Hugo by now, but I’ve been using WordPress for some 13 years and combined with WP-Super-Cache it’s been static for pretty much that entire time. There’s little point to putting in extra time and effort just for some extra nerd cred. On the downside, every new 4.0+ release seems to add more cruft to the header. My functions.php consists of an ever-growing list of remove_action incantations. Here’s the latest addition, necessitated by WordPress 4.9. For those interested, here’s my full messy collection, including a few hints I commented out. remove_action('wp_head', 'rsd_link');// Windows Live Writer? Ew! remove_action('wp_head', 'wlwmanifest_link');// Windows Live Writer? Ew! When I logged in, WordPress tried to inform me that the particular browser I was using was out of date. 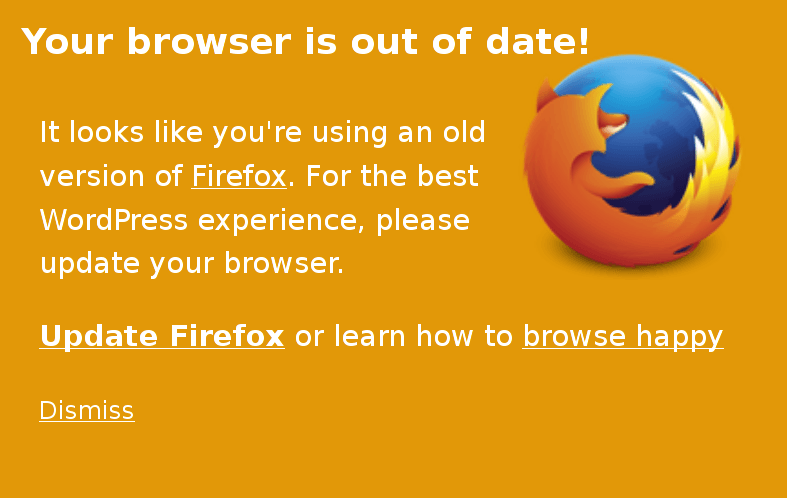 WordPress’ “Your browser is out of date” greeting. Well, we can take a look at the Firefox ESR download page to find out. 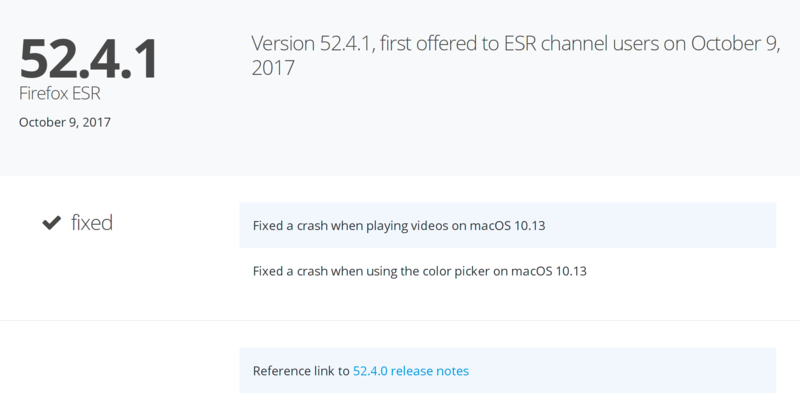 The current version of Firefox ESR is 52.4.1, releasenotes here. Nope. 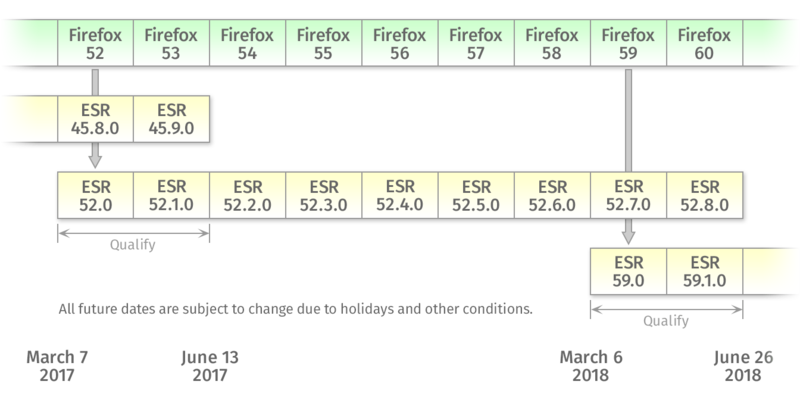 Still Firefox 52, which will remain supported until Firefox 60. For a long time I’ve been aware of the fact that few, if any, WordPress themes seemed to do anything with the META element’s description feature. I never bothered to look into a solution, especially since I never used to add excerpts to my posts half a decade ago. However, I’ve bothered to do so ever since I started notifying people about updates on Twitter. It already makes the search results much more readable if you’re looking for something in the archives of this site, and I figured I should do the same for search engines. Add the whole thing anywhere in your HEAD element in header.php. If excerpts seem to be missing from pages, there’s a simple solution. If you want to reuse the code above for some reason, wrap some sort of function around it and stick it in functions.php. Enjoy. WordPress can’t cope with day/month/year (/%day%/%monthnum%/%year%/) permalinks properly by default. I had no idea because I’ve always used year/month[/day]. It’s fine for the posts, but in the archives /date/month/year fails. Luckily WP (WordPress) supports plugins in a clever manner, and it has a great API (application programming interface). This kept giving me an error which I couldn’t (be bothered to) debug since it went several functions deep into the WP core, so I gave up on the API and circumvented it with the help of something I found. Anyhow, here’s the plugin. Save in a file named rewrite-day-month-year.php or just name it whatever you like. Description: WordPress can't cope with /%day%/%monthnum%/%year%/ for some reason. That is to day, it fails when you try to go for an archive in the form of /date/month/year/ This teaches it some manners. Probably/hopefully shouldn't interfere with other structures, but why you'd activate it if you don't need it I wouldn't know.